Toshiba S50-B-12T Cheapest Core i5 Laptop 15.6" Intel -4210U 6GB RAM 750 GB HDD. Beauty meets power in the elegant Satellite S50-B -- the super-slim but powerful PC that enhances both productivity and entertainment. At just 19.9 mm thin, with a chic silver brushed metal finish and frameless backlit keyboard, the S50-B is beautifully designed. 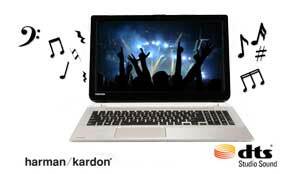 Harman Kardon stereo speakers are tuned and enhanced by DTS Sound, so you'll hear every word, and never miss a beat. What's more, with the power of Intel Core processors, as well as optional graphics, you know you can always count on a seamless, responsive entertainment experience. At just 19.9 mm thin, the 39.6 cm (15.6-inch) Satellite S50-B looks and feels great, wherever you take it. The silver brushed metal finish is elegant and stylish, and continues throughout, providing the ideal contrast to the tiled and backlit keyboard to complete the stunning design. Premium Harman Kardon stereo speakers and DTS Sound combine to give you clear, distinct and immersive sound. From smoother bass to clearer speech, every voice, movement or tune will be more distinct and enjoyable with class-leading Harman Kardon stereo speakers. Add to that the superior quality of DTS Sound enhancement, and your audio will be rich, deep and vibrant. So you're always ready to immerse yourself in realistic surround sound every time you stream a movie, watch a video, play games or listen to music. The Satellite S50-B is equipped with two integrated Harman Kardon speakers, reproducing your music in rich, high quality stereo. The sound is delivered across the speakers, creating a life-like audio experience. The premium quality allows you to enjoy your music and movies in parallel with high definition picture quality, ensuring an enjoyable entertainment experience. 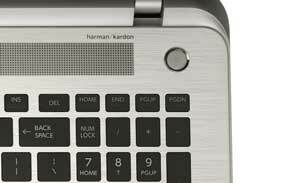 The silver brushed metal chassis elegantly offsets the backlit tiled keyboard. The integrated Harman Kardon stereo speakers are positioned below the screen and combine with DTS Sound audio suite to ensure that music or film soundtracks can be enjoyed at their best. DTS Sound includes a sound-enrichment suite that boosts volume, enhances bass and improves definition. Enjoy immersive audio complete with deep, rich bass and crystal clear dialogue. DTS Sound also delivers high-frequency definition for crisp detail in any listening environment, ensuring users a premium and natural entertainment experience whether you are using the laptop speakers or headphones. Enjoy Ultra HD content on the big screen with HDMI. Fully immerse yourself in your favourite movies and online content, thanks to the Satellite S50-B's 15.6" display. 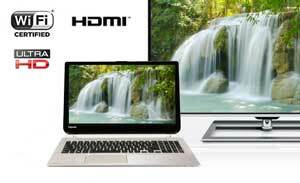 You can see everything clearly on the HD screen -- or watch the Ultra HD 4K content stored on your laptop on an Ultra HD capable TV, using the HDMI-out port. To ensure the picture is super-sharp at all times, Toshiba's built-in Resolution+ technology will enhance the quality of your video and photo content in real-time. 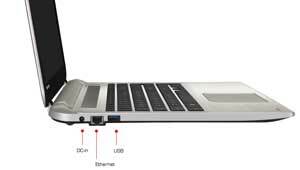 The Toshiba Satellite S50-B has an integrated HDMI port for added convenience and enhanced usability. You can connect your laptop to an external device and stream high definition content. When using HDMI, audio and visual content are streamed through a single cable, removing the need for multiple connections. You only need one cable, making connecting your laptop easier and tidier. Thanks to HDMI technology, when connecting to a compatible display via a HDMI 1.4 cable, you'll be able to output 3D entertainment to the big screen. You'll even be able to experience entertainment when pairing this laptop with 4K display. Thin, light, and full of connectivity -- the S50-B comes without an internal optical drive to save on space and weight. The S50-B laptop is powered by a multi-core processor, for a difference you can really see and feel in your multitasking and multimedia. When combined with optional dedicated or integrated graphics, you can count on a smooth, responsive performance -- with enhanced 3D rendering, more complex shading, and fluid character motion. You have all the space you need to store and secure your data locally, with up to 1 TB* of HDD storage built-in. The S50-B is optimised for the wireless user too -- there's no internal optical drive, just a full range of connectivity options to hand, so you can access everything you need quickly and easily, whenever you need to. 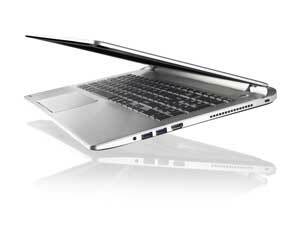 See some of the features of the Toshiba Satellite S50-B laptop. The S50-B supports Wireless Display, which allows you to seamlessly share content between devices such as TVs and projectors. The Satellite S50-B also comes with one USB 2.0 port, two USB 3.0 ports and Bluetooth 4.0, making it quick and easy to transfer large data quickly to your other devices, upload your camera photos, share movies and sync your mobile devices wirelessly. You can even recharge your phone or MP3 player without switching your laptop on, with USB Sleep-and-Charge. Or connect to HD TVs and displays with HDMI. There's no need to carry around multiple charging accessories when you have your S50-B. With the Sleep N Charge USB port you can charge your mobile phone, MP3 player and other digital gadgets even while your laptop is switched off. You can charge your gadgets overnight and wake up to a fully-charged battery. 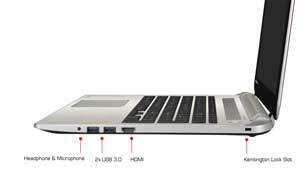 This laptop includes Bluetooth 4.0 which allows you to connect and share files wirelessly over short distances. This makes it ideal for connecting to compatible mobile devices such as smartphones, MP3 players, and more. You can also use Bluetooth to connect to wireless peripherals, such as headsets, speakers, mice and keyboard, making it easier to use your laptop on the move or at home without the clutter of connecting wires. *Features differ by model -- check technical specifications for details.